Setting a new world record for quantum teleportation, two separate teams of scientists have managed to move small units of information from one place to another over several kilometres of fibre optic cable. 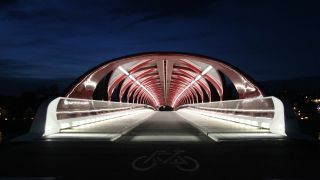 The teams, working in the cities of Calgary in Canada and Hefei in China, used fiber optic networks already in existence to teleport information from one place to another, a feat which, until now, hadn't been achieved outside of a lab. Quantum teleportation is never going to send humans instantaneously from one place to another – so don't start planning those long haul holidays. What it does offer is an extremely secure method of communication and encryption. Quantum teleportation relies on a phenomenon called quantum entanglement, whereby some particles remain connected no matter how far apart they are. This means that should the state of one particle change, the other will be instantaneously affected through a transmission of information that's faster than the speed of light. As the particles communicate via entanglement, it would be next to impossible for an outside source to read the information encoded in them. To decrypt any message, a separately sent key is required which, even if intercepted, would require the person to also have possession of the entangled photons. In the Calgary experiment, Dr Wolfgang Tittel and his colleagues managed to teleport the quantum state of a photon over 8.2 kilometers. The process of teleporting the information involved creating two photons at the University of Calgary. One of these photons was sent along 11.1km of optical fibre to a building near Calgary City Hall whilst the other was kept at the university. A third photon encoded with information is then sent to the City Hall building from a third location to meet the second photon resulting in the data from the third photon being transferred to the first photon at the university due to its state of entanglement to the second. Make sense? Good. It's not the simplest of processes – even Einstein wasn't completely clear on it, summing it up as a "spooky action." In the Chinese study, the researchers used a slightly different method which, whilst more time consuming and slower, did tend to yield more accurate results. Experiments making use of quantum entanglement over long distances have been performed before now; in 2012, Anton Zeilinger of the University of Vienna carried out quantum teleportation over 143km between two of the Canary Islands using lasers. Lasers sound cool, but they aren't completely reliable in all environmental conditions. By using fiber optic networks already in existence, these experiments could be used as the basis for further research on creating metropolitan quantum communication networks. Though we won't be jumping into teleporters any time soon, quantum teleportation will most likely be used as a method of encrypting information and sending secure communications.